Enio Iommi’s artistic formation began in his father’s craft workshop. In 1939, he moved with his family to Buenos Aires. In 1945, he was among the founders of Asociación Arte Concreto-Invención, which the following year, published the Manifiesto Invencionista and organized an exhibition at the Salón Peuser (Buenos Aires). In the manifesto, Iommi and the members of the group proclaimed, “The artistic era of representative fiction comes to an end [ . . . ] Concrete art leads man to the direct relation with things and not with the fiction surrounding things [ . . . ]. Neither to look for, nor to find: to invent.” At this time Iommi made his first abstract sculptures that were linear structures constructed of metallic rods, generally of aluminum, either rectilinear or twisted, that effected the integration of space. In 1952, Iommi joined the Grupo de Artistas Modernos de la Argentina, promoted by Aldo Pellegrini. Later, he participated in the Exposition Universelle et Internationale (Brussels, Belgium, 1958), where he received a gold medal, as well as in Konkrete Kunst: 50 Jahre Entwicklung (Helmhaus, Zürich, Switzerland, 1960), an international exhibition of concrete art organized by Max Bill. 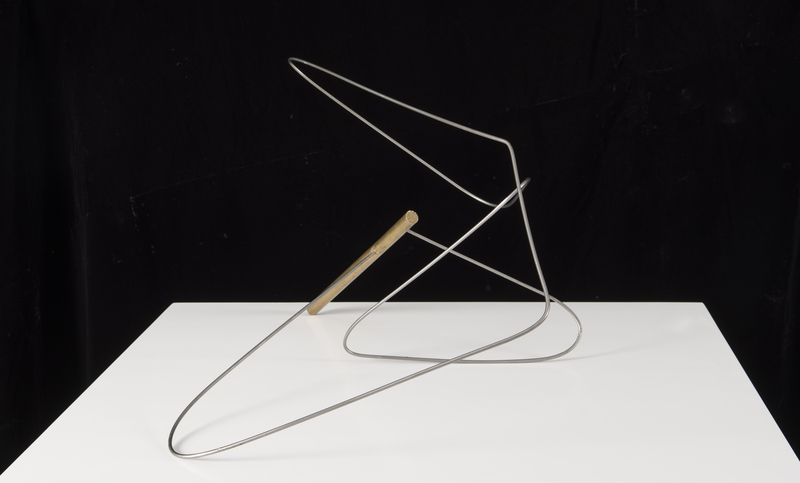 By that time he had begun to leave behind the rigorous purity of the concrete movement to create, throughout the 1960s and the 1970s, less linear, freer, and more irregular sculptures. During these years he exhibited at the Museu de Arte Moderna (Rio de Janeiro, 1962) and in the Galería Carmen Waugh (Buenos Aires, 1971). This latter exhibition, titled Una línea, un espacio, included an installation made out of tightened cables that crossed the space it occupied, causing both virtual and real spaces that could be crossed by spectators. During the military dictatorship in Argentina, between 1976 and 1983, Iommi had a solo exhibition Adiós a una época (Galería del Retiro, Buenos Aires, 1977), which showed the beginning of a new stage in his career. Following this show he made assemblages with “ignoble” materials and from waste which he left rustically finished. They were dramatic pieces that alluded to the violence and tragic events of the times. In 1980, the Museo de Artes Plásticas Eduardo Sívori (Buenos Aires) organized a retrospective of his trajectory titled Esculturas de Enio Iommi, 1945-1980. In his more recent works, Iommi utilized daily objects and domestic items, which he transformed, accumulated, and/or assembled to portray either an intimate and poetic vision or a more contemporary and symbolic composition.